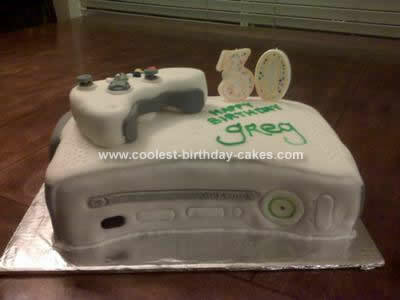 This Xbox Birthday Cake Design is the first xbox cake that I made. I made it for my brother’s 30th birthday party. He is an xbox gamer, so I thought it would be the perfect cake for him. 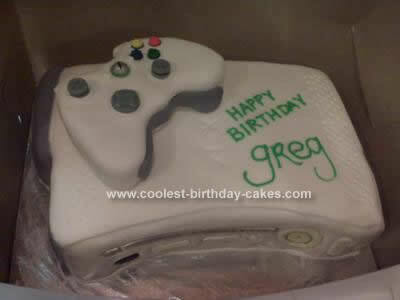 The cake is the same dimensions as the actual xbox and controller. 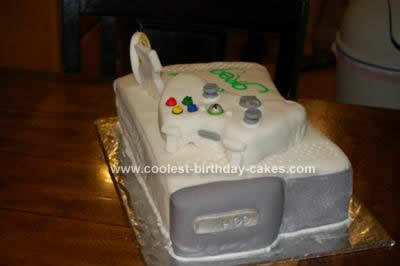 The cake and the controller are both made out of cake and wrapped in fondant. All the details are made from fondant, frosting and edible paint. I started with tracing out the actual shape of the gaming console and used that as my template to get the exact shape. After baking the cakes and refrigerating them, I cut out 3 cakes to get the right height measurement. I filled and stacked 3 cakes and covered it in fondant. I did the same thing for the remote except there is only 2 layers of cake and one layer of filling in that. The rest of it was very time consuming because of all the detail involved. This cake was a lot of fun to make. 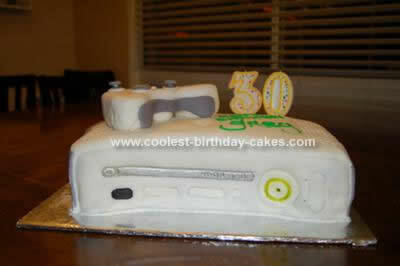 This was the first xbox cake that I made, I have made one more since then. Your cake design was excellent. I understand how much time you must have put into making this cake. I make cakes for my grandchildren,and I’m getting ready to use your design for my grandson’s 12th birthday on 7 May. Thank you so much. Best regards!